I have finally got around to attempting my very first piece of amigurumi (Howie Woo will be so proud)!!! 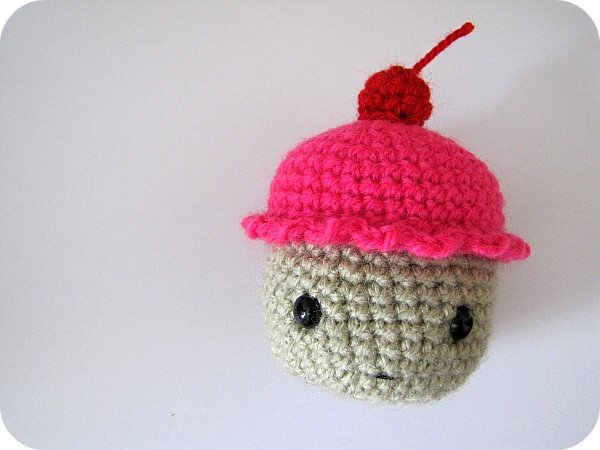 Presenting my cute Raspberry Cupcake with a cherry on the top - thanks to this awesome pattern on Nimoe's blog. I had so much fun making it and can't wait to make more different 'flavours' and styles. I have a few other patterns that I'd like to try out, so will let you know which is my fav later (because trust me... it's not easy wading through the cupcake crochet patterns out there!). 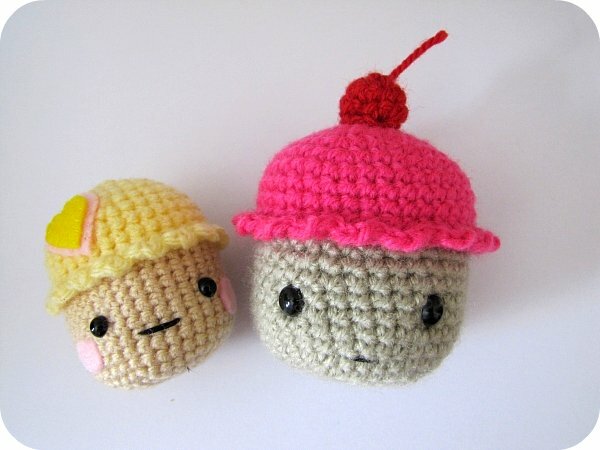 My cupcake and Donna's one hanging out together. Pop along to Kirsty's for more creative spaces. For Amigurumi inspiration, visit here. arrggh I can't see cos all my broadband is used up! Bet it's cool as though! I love it! would love to have a go at one of them someday, I'm still at the granny square crochet stage! cute, I like that she has company round to play! I can't believe you haven't been doing this already! you're a pro! eeeeep! cute! oh my gosh, this is so cute!! i really really need to learn this immediately. i could so handle one of those cupcakes! Oooh la larrr that is one cute cupcake. I am very impressed with your skills there friend. 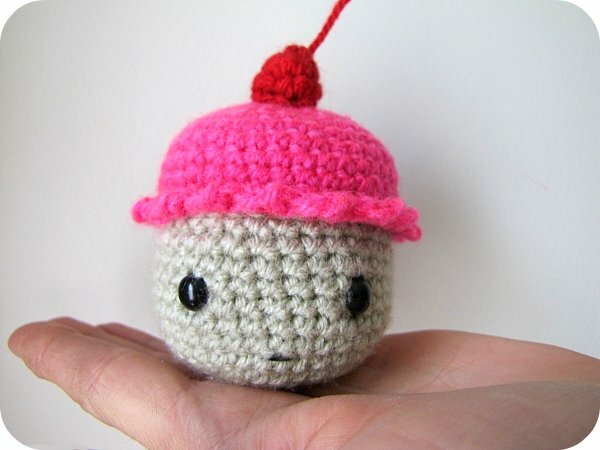 When I move back to NZ can I pay you to teach me to crochet? I love the things you make but I just cant do it!! aww, so cute and yummy looking! SO CUTE! LOVE IT! Hmmm... a give away sometime eith one of those may be in order????? Lovely work! I bet you get addicited to them - do you find it tricky working on that scale or ok? That is so cute! 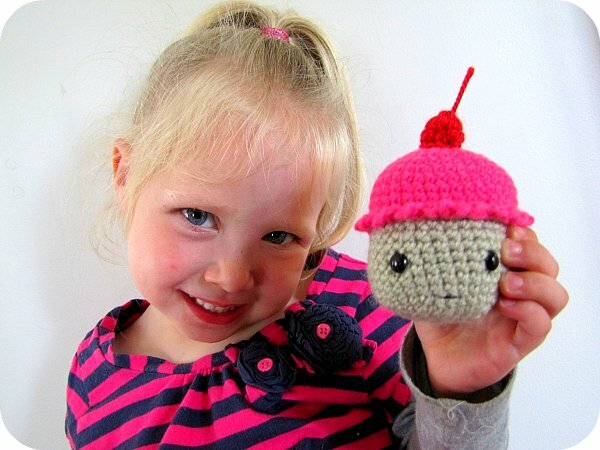 I might have to try making one for my daughter - when I have some spare time that is! Oh so very cute - LOVE the cherry on top. The cherry on top TAKES THE CAKE (so to speak). I have been searching everywhere for this cupcake!!!! everywhere I tell you! (not that I could ever make it but it would look soooo cute on mty sewing table) Are you going to be putting them in your shop?? Love it!